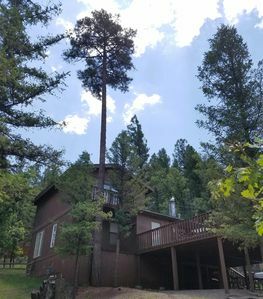 Situated in Ruidoso, New Mexico, 'Canyon Creek Lodge' offers the perfect getaway for groups and families seeking a rejuvenating escape from the hectic pace of everyday life. 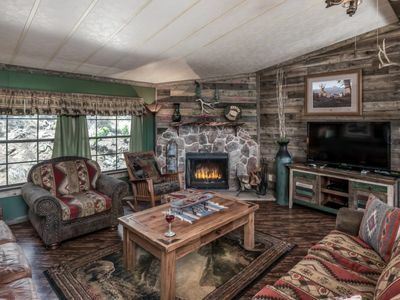 This 2-bed, 1-bath vacation rental can host 5 guests amidst 650 square feet of rustic living space, outfitted with a spacious patio and immaculate river rock fireplace. 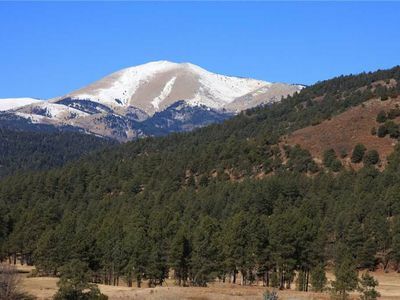 When you're not exploring nearby hiking trails or strolling along Carrizo Creek, visit Ruidoso Downs or the Inn of the Mountain Gods Resort & Casino! 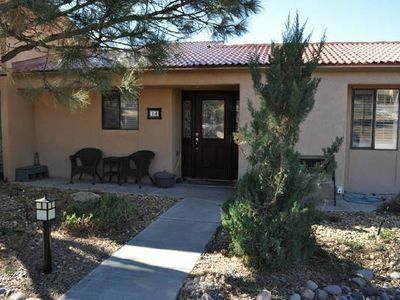 Drive through downtown Ruidoso and the quiet community of Canyon Creek Lodge to approach your new home-away-from-home. 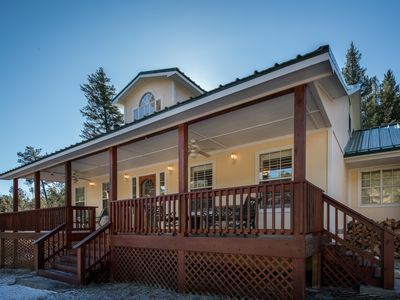 You're sure to spend quality time on the front porch, where you'll enjoy views of the sylvan setting and hiking trails which surround the home. 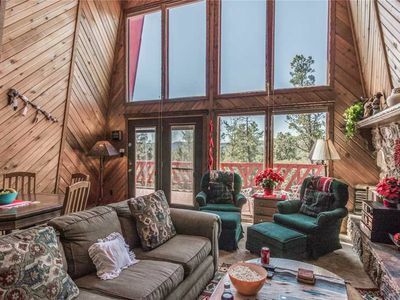 This is the perfect spot for a morning cup of coffee or one last night cap before bed. 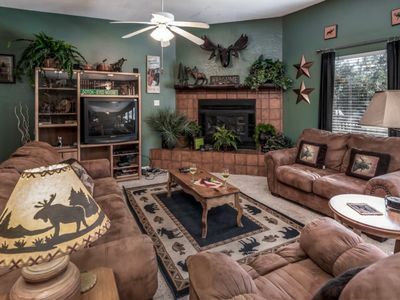 Inside, the simple charm of this homey bungalow is sure to impress. 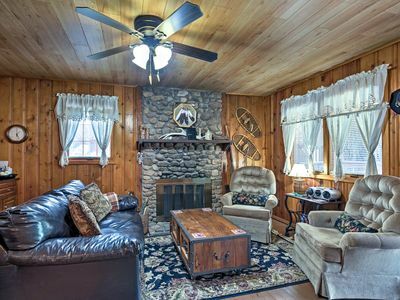 The stylish wooden interior is complete with comfortable furnishings, hardwood flooring, and cabin decor. 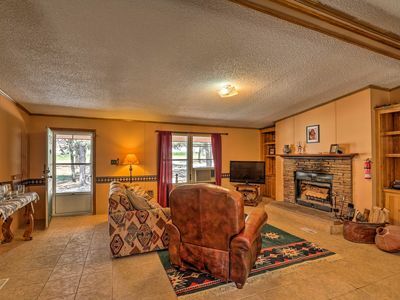 Settle down in the spacious living area, perfect for family or group gatherings. 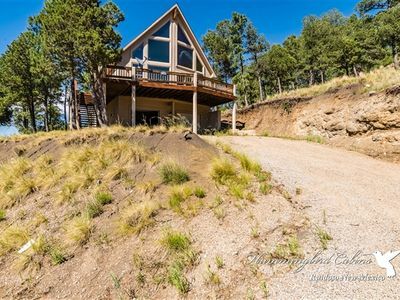 For optimum relaxation, turn on the mounted flat-screen cable TV or forge a flame in the magnificent wood-burning river rock fireplace. 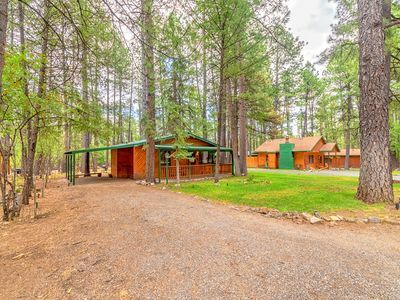 When everyone has worked up an appetite, prepare some snacks or heat up some leftovers with help from the well-equipped kitchenette, featuring a mini-fridge, microwave, hot plate, coffee maker and plenty of utensils. 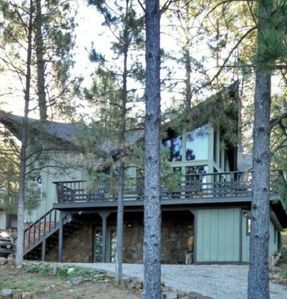 For a more advanced at-home dinner, the gas grill and outdoor dining area can assist. As bedtime approaches, retreat to your master bedroom complete with a king-sized bed and beautiful decor throughout. 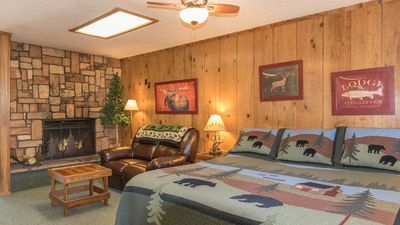 When the others are ready to turn in, they can enjoy nights of peaceful sleep in the additional queen bedroom and couch in the living area. 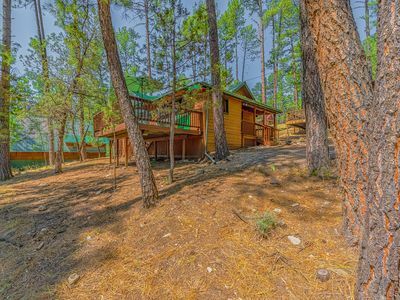 Secluded amongst trees, streams, and wildlife in a quiet community, you'll find it hard to leave the tranquility of this cozy cabin. 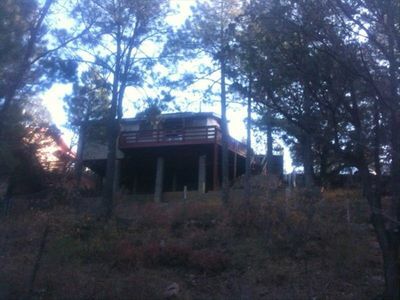 That said, Ruidoso is brimming with outdoor adventure for those wishing to explore! 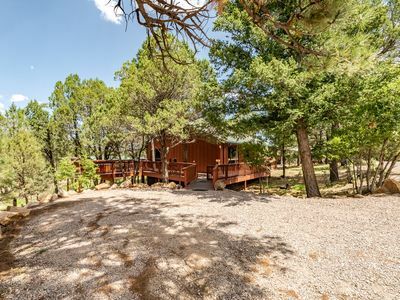 For a laid-back day full of shopping and dining out, head into downtown Ruidoso, just 5 miles from the cabin. The local eateries, such as Cornerstone Bakery & Cafe Co, Hall of Flame Burgers and Sacred Grounds Coffee & Tea House are sure to impress. Spend the morning exploring the nearby Grindstone Lake. 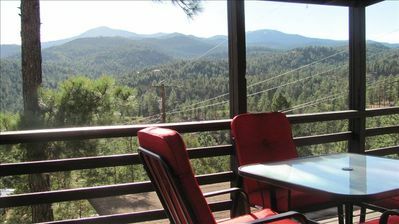 Then, test your luck in the afternoon at the Inn of the Mountain Gods Resort & Casino and the Ruidoso Downs Race Track. 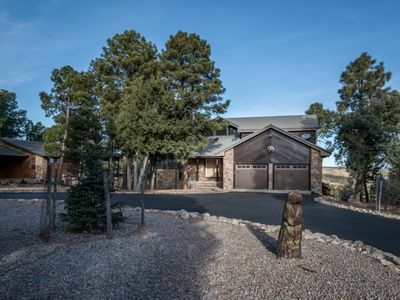 Outdoor enthusiasts, be sure to take advantage of the home's proximity to Ski Apache, just 40 minutes from home and Lincoln National Forest 50 minutes away. Plan your next day trip to White Sands National Monument an hour and 15 minutes from the property. Big mountain views on golf course. 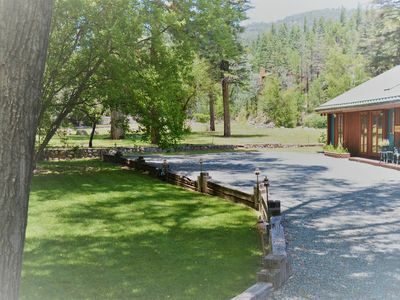 Hummingbird Cabin: 'An Inviting Getaway!' With hot tub. Pet friendly. 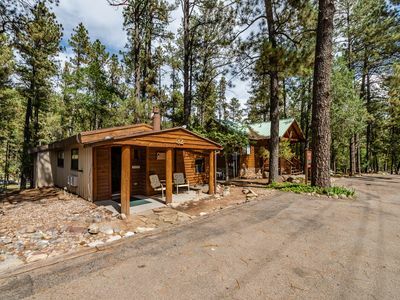 “Singing Pines” cabin will have you singing in no time! 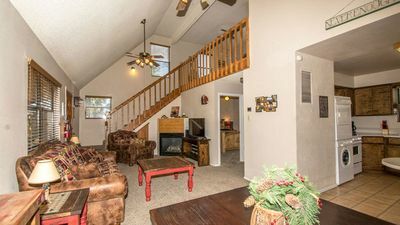 2 bed/ 2 bath with private outdoor hot tub!